Publisher: Geoffrey Nevine May 10, 2017 This information is provided solely as a guideline. 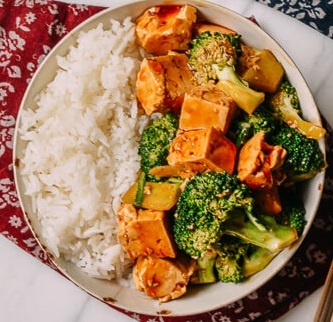 A tofu veggie stir fry made tasty with a simple technique that gives the tofu perfect texture and flavor. Serve over rice or on its own for a healthy and delicious weeknight meal. Heat 3 tablespoons olive oil in large nonstick skillet or wok over high heat. Add tofu; stir gently until starting to brown around edges, about 4 minutes. Using a slotted spoon, transfer to a bowl. Add 3 tablespoons oil, ginger, and garlic to skillet; stir 1 minute. Add mushrooms; stir-fry until tender and golden around edges, about 5 minutes. Add broccoli, bell peppers, and green onions; stir-fry until vegetables are crisp-tender, about 3 minutes. Return tofu to skillet; stir to mix. Stir in sake, soy sauce, and sesame oil; simmer 1 minute. Season with salt and pepper. Transfer to large bowl and serve over rice.